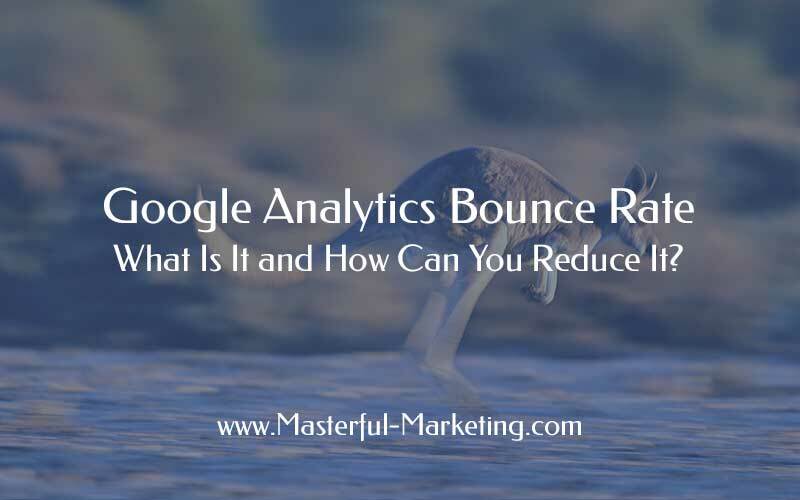 Google Analytics Bounce Rate - What Is It and How Can You Reduce It? Google Analytics collects a lot of data, which for most of us can be a bit overwhelming. We don’t have time to spend hours every day studying our website analytics and what the information means. But Google now sends emails to analytics account owners with their stats. 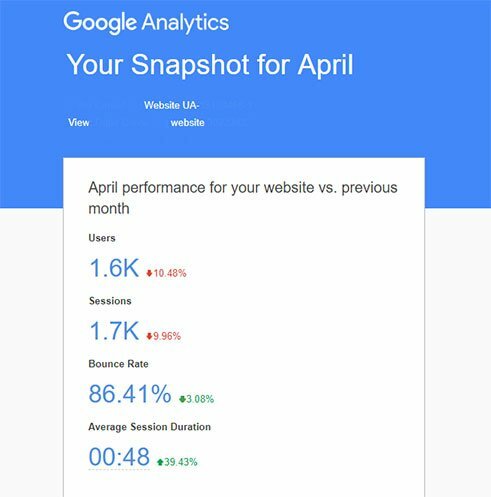 And that high bounce rate number tends to catch the attention of many website owners. When they see these numbers, they become concerned that there is something wrong. Are my messages not clear? Am I targeting the wrong audience? Is my design not attractive? And unfortunately (or fortunately), a high bounce rate may not be any of these. The simple definition, although not quite accurate, is that bounce rate is a single page visit to your website. According to Google, a bounce is calculated specifically as a session that triggers only a single request to the Analytics server. In other words, someone opens a link to your website (a page or a post) and then leaves without having any other interaction on your website. The bounce rate is pretty binary as well. If you land on this blog post, read it and leave, that would produce a 100% bounce rate for your session. If you land on this blog post, read it and then perform some other “interaction” event, i.e. play a video, fill out a form, or interact with something else on that page, that would be considered an engagement and would produce a 0% bounce rate for your session. Therefore, if an additional session is triggered when a visitor lands on your page, that visit is not considered a bounce even if they don’t view any subsequent pages on your website. Not necessarily. Some pages may naturally have a high bounce rate. Blog posts will almost always have a higher bounce rate because people search, find your blog post on the topic, read it and leave. They are on a journey to find the answer to something and your post may solve it. Exiting that page after the post is read is expected. And since bounce rate does not take into account the amount of time a user is on a page, a quality blog post may have kept the user’s attention, given them the information they were looking for and satisfied their need. Consider the goals you set for your website. If your goal is to have visitors consume a lot of content, then a high bounce rate can be a signal that something is wrong. But if your goal is to have visitors respond to your call to action, then a high bounce rate is not a problem. however, lack of conversions are. Calling you directly to find out more about your products and services. Google themselves say: “If you have a single-page site like a blog, or offer other types of content for which single-page sessions are expected, then a high bounce rate is perfectly normal”. In addition, one common misconception is that bounce rate affects your ranking. That is not true. Search engines don’t have that data on all sites because not all sites have Analytics installed. Therefore, it would be an unfair signal to use for ranking purposes. If a user lands on a page of your website and very quickly (almost immediately) hits the back button, that could signal to the search engines that there is something wrong with the search result. That activity is called pogo-sticking and could indicate that something is inconsistent between the search and the result. There really is no single bounce rate percentage that all websites could achieve. 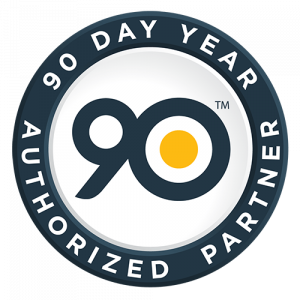 On average, a bounce rate around 50% is considered fine. A little higher is expected if you have a blog. 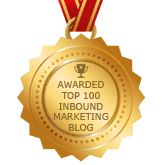 What can you do to lower your bounce rate? If you are really concerned about your bounce rate, here are some things you can do to keep people from leaving your site after one interaction. Do you know what keeps them up at night or causes them pain? How well do you understand their needs or desires? What questions do they ask and why? How do your products and services can help fulfill a need? Write your content around those areas making it the go to content for those who you truly want to work with as clients. Adding cornerstone content to your website can create a robust resource for your visitors. If you structure the content properly, visitors interact more on your website because the deep links will lead them to more in-depth content on a specific topic. Linking internally to other great posts you have from within your content is important. It’s also important to link to external content that can support your thoughts and ideas. However, if you do link externally, be sure to open any external link in a new window or tab. If you don’t, you send your visitor away from your website with a potential to not come back. Give your visitor the opportunity to finish reading your content and guide them to their next interaction. Make sure your call to action relates to the content the visitor is reading. Making non-relevant offers just to do something will only chase people away faster. You could have the best, most comprehensive content on a particular topic, but if the visitor can’t scan it quickly to see if it is what they are looking for, they will leave in a heartbeat. Formatting your content to be easy to consume and digest by using appropriate headings, bulleted lists, short sentences and images where it adds value to the content. Easy to scan and read content may not avoid a bounce, but it will surely prevent visitors from pogo-sticking away from a wall of hard to read text. With the speed of everything we have available to us, human patience is a rare commodity. If your page takes a long time to load, you will lose most visitors before the page finishes rendering. Regardless whether the content is exactly what the visitor was searching for, if it doesn’t load quickly, your bounce rate will be very high. Plus this is even more critical for mobile users. Yes, I did say that a tasteful pop-up form is one way to encourage people to take some action, but the difference between a tasteful pop-up and one that disrupts the user’s content consumption can be the difference between converting a visitor into a lead or chasing them away. Nothing is worse than trying to read an article and having pop-ups or ad inserts move the content around so you lose your place. Use common sense when you add them and avoid creating a bad user experience for your visitors. Bounce rate is a metric that should be tracked but not stressed over. Take it as a guideline as to how engaging your site is but not something that impacts your site negatively unless people are hitting the back button really fast all too often. Add some of the above tips to lower your bounce rate and worry about more important metrics, such as conversions, sales and inbound leads. Amazing post. Decreasing the bounce rate is all we want and the tips and tricks you have shared are amazing. I appreciate your effort in writing this post.